I am all about self care Sunday! Sunday's are one of my favorite days. I usually go grocery shopping, meal prep and plan, and get my clothing picked out for the week. Being prepared for the week helps a lot with stress. When I have everything planned, I am more likely to stay on track. Sunday nights I really enjoy taking a detox bath, reading, and applying a face mask. Very simple, and relaxing. 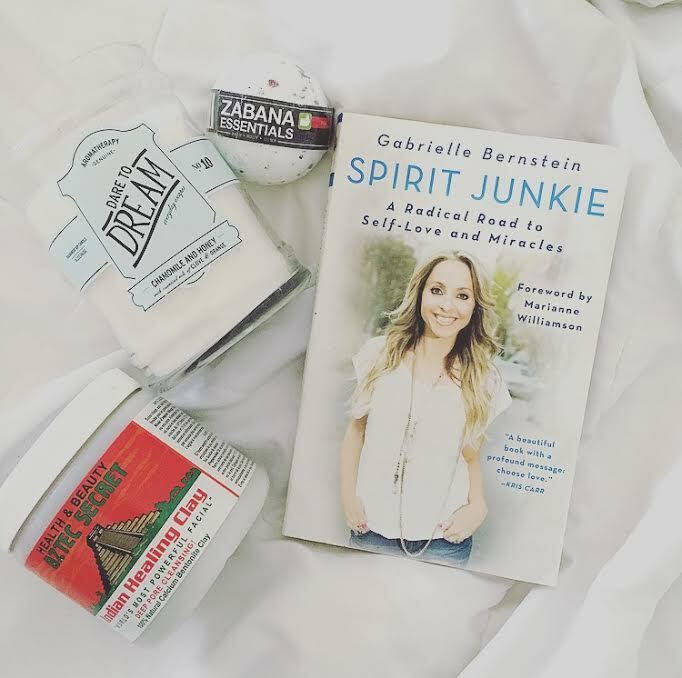 I wanted to share what I am reading, and some of my favorite non-toxic beauty finds. Zabana Essentials is one of my favorite vegan beauty brands. I love their deodorant, bath bombs, and facial products! If you are looking for a vegan, non-toxic beauty brand, I really recommend trying them out. I am currenlty reading Spirit Junkie, by Gabrielle Bernstein. This book is amazing! It's all about finding inner peace, and self love. If you have not tried Aztec Secret Indian Healing Clay - you NEED to. It's one of my favorite cleaning masks. No crazy ingredients, and it makes your skin glow! I found it at VitaCost, and it was under $6!! Now, I am going to take a relaxing bath, and enjoy my new candle that I found at Target! Beautiful patch work for quilt! I am sure the end result will be great as well. Will you be showing the completed quilt after you are done?